Former ONE Flyweight World Champion Kairat “The Kazakh” Akhmetov has the chance to make a definitive statement and recapture lost gold as he is slated to take on a familiar foe in his upcoming bout. Akhmetov will be entering enemy territory to battle Filipino rival Geje “Gravity” Eustaquio in the main event of ONE: GLOBAL SUPERHEROES, which takes place at the 20,000-capacity SM Mall of Asia Arena in Manila, Philippines on 26 January. It is also a rematch of their main event tilt from ONE: TOTAL VICTORY in September of last year, where Akhmetov got the better of the 28-year-old Baguio City native and earned a razor-thin split decision nod. The stakes are much higher in their second encounter as the interim ONE Flyweight World Championship title is up for grabs. Akhmetov admitted that he was shocked when he initially received the news that he is booked to face Eustaquio in a rematch at ONE: GLOBAL SUPERHEROES, which marks as the 12th foray of the organization on Philippine shores. After defeating Eustaquio four months ago, Akhmetov undeniably expected that he would be pitted in a rubber match with reigning ONE Flyweight World Champion Adriano “Mikinho” Moraes, the man who blemished his previously-immaculate professional record in their second meeting in August of last year. Even though Akhmetov did not get the trilogy bout that he desired, the Kazakh wrestling dynamo is up for the challenge, asserting that he is highly motivated to once again defeat Eustaquio in his own backyard. The maiden cage contest against Eustaquio was a quick turnaround for Akhmetov, who had lost the ONE Flyweight World Championship to Moraes a mere six weeks earlier via unanimous decision, albeit following an almost two-year layoff. Akhmetov revealed that he had slight difficulties preparing for his first bout with Eustaquio as he was coming off a disappointing setback and nursing minor injuries. “It was hard to prepare for Geje back then, because it was on shorter notice that I was used to, and I had some little injuries coming off the title match. But during the match, it did not affect me, and I did not feel any cage rust like I did against Adriano. That time, it was hard, both physically and mentally,” he said. 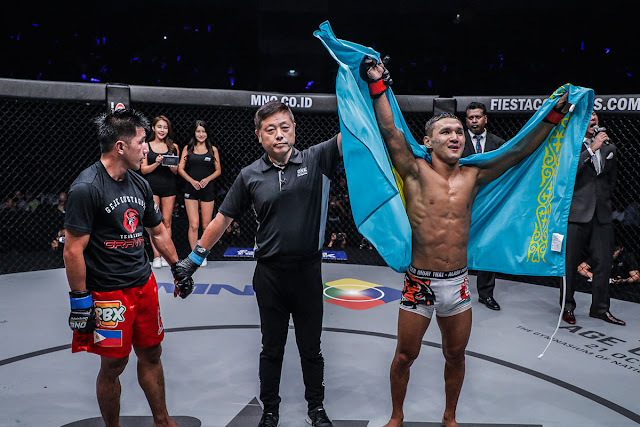 The first match-up between Akhmetov and Eustaquio proved to be a thriller as it could have gone either way, but two of the judges at cageside favored the Kazakh, leading to a split decision victory. Akhmetov believes that his split decision triumph over Eustaquio in September of last year was justified and well-deserved. “I do not think it was controversial. I thought I dominated the match, and it was not close at all,” he explained. Although they have had 15 whole minutes to become acquainted with what each has to offer in the first bout, Akhmetov feels that things will play out differently in the rematch. According to Akhmetov, his five-round championship clash versus Eustaquio at ONE: GLOBAL SUPERHEROES is the perfect opportunity to prove once and for all that he is the better warrior and take a step closer to the trilogy match with Moraes that he so longingly wants. “In 2017, I had ups and downs. I do not want to look back. In 2018, I am looking forward to reaching my dream to battle Adriano Moraes for the third time. But of course, I have to beat Geje Eustaquio first to fulfill my dream,” he declared.